Chairman Gokaraju, Rangaraju Educational Society Dr. Gokaraju Ganga Raju is an eminent industrialist, politician, educationist, philanthropist and social engineer. He spearheads Gokaraju Rangaraju Educational Society (GRES). His far-reaching vision to generate a culture of educational excellence, established Gokaraju Rangaraju Institute of Engineering in 1997. This marked the beginning of his tryst with education. 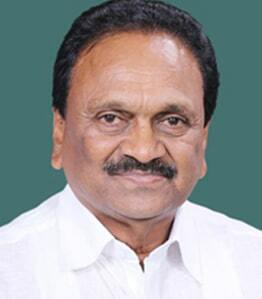 In his continuous effort to reinforce the commitment to achieve that extra mile in the field , he established many such institutes - Gokaraju Rangaraju College of Pharmacy (2003), ASRAM Medical college , MBA and MCA colleges. These institutions have raised the bar for technical education in South India. True to his philanthropic nature, he created opportunities for access to education, to every rung of the society. Awasa Valmiki Vidya Kendram in Khamam, AP; VKDVS Degree College, in tribal area to support the higher education needs of the poor and needy, 200 Ekal Vidyalaya's in tribal areas, are standing proofs of amalgamation of his passion and nature. Dr. Raju established the Ganges Valley School with an insight to ‘catch them young’, to root children in values and thinking skills. Vice-President, Gokaraju Rangaraju Educational Society Carrying forward the legacy Mr. Ranga Raju has his feet firmly grounded in the field of education. He is well informed of the challenges of today’s educational sector. His blend of intellect, innovation and experience, as an industrialist and an educationist, augments the genesis of GRES – which is at the pinnacle of global and futuristic education. Being an avid sportsperson himself and the president of Andhra Cricket Association, his emphasis on physical and social development is through sustainable practices. Executive Director, Ganges Valley School Bringing fresh energy, management expertise and inherited knowledge into today’s ever-evolving education ecosystem, Ms. Vani a young Edupreneur has been contributing to the cause of education development ever since the inception of the school. She adeptly manages numerous academic ventures and remains a true leader who leads by example, is warm, sincere and always willing to walk the extra mile to deliver on promises. She is a prolific visitor and travels widely with a one-point agenda to imbibe and assimilate the best available practices of the various education scenario. Her desire to create a milieu which is unique, and trendsetting have enabled her to create a brand name –Ganges– in the field of education.